When you read the real estate market stats in the newspaper and hear it in the media its quite evident that Vancouver’s housing market continues to remain cool. Sales in February across the region were down again in February some 29% compared to last year and year to date are down 23%. Home prices to are down but ever so slightly. On Vancouver’s Westside what’s going on really is neighbourhood specific and property specific. I am still seeing the strongest demand in Building Lots ( lot value properties). We sold 2 building lots in February, 1 in Dunbar and 1 in Shaughnessy. Both homes attracted multiple offers with the final selling prices moving way over the asking price. New Construction appears still very soft with a glut of new homes on the market and very few homes selling. There have been some generous price declines on some properties where home owners need to sell. For those that do not have to sell, many homeowners have taken their homes off the market waiting for better times. During the month of February there were 104 single family home sales compared to 177 last year. That is a decline of 41%. Year to date home sales are down 28% from 263 units last year to 187 units this year. The average selling price of a single family home was up 8% this February versus last year to now sit at $ 2,877,809. 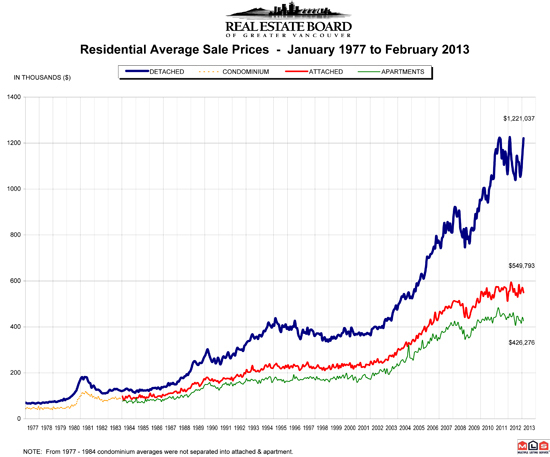 Year to date the average selling price is 1% higher than last year at $ 2,641,693. There were 890 homes on the market for sale at the end of February this year versus 777 last year, an increase of 14%. Month’s supply increased from 4.4 last year to 8.5 this year indicating we are still in a Buyer’s Market. Townhome sales fell 19% this February compared to last year and Condo sales fell 21%. Year to date Townhome sales are down 8% and Condo sales are down 15%. The average sale price of a townhome was just 1% lower than a year ago to now sit at $ 859,473 and Condo average sale prices were 13% lower to $ 589,689. Year to date townhome prices are down 1% and Condo prices are down 11% from the same time a year ago. The supply of town homes and condos is virtually unchanged from a year ago. The month’s of supply for townhomes has risen from 5.7 a year ago to 7 months this year. Condo supply has climbed from 5.4 to 6.8 months this year. Over all stats show a soft but fairly stable market with supply levels only marginally up and prices showing resilience. There are pockets where prices have fallen by as much as 15% but for the most part price declines are fairly muted. I would say at the High-End of the market over $ 3 million there are potentially some pretty good deals to be had. Building lots and Lot Value homes in the sought after locations seem to have price stability.